One lump or two? Tea sets bring waves of nostalgia as we remember a time when we also sat down for pretend tea treats. Whether we were entertaining our toys, friends or family, tea parties were a delightful affair. The feeling hasn’t changed and kids today enjoy hosting tea parties as much as we did. Perhaps a little more, with all the “sophisticated” sets they get to use. That’s why we’re going to explore some of the best toy tea sets available today, whether for pretend play or otherwise. Use the links above to check the latest prices or read our in-depth toy tea set reviews below. It’s easy to grab the next tea set you come across because they’re all so cute. But here are a couple of things to keep in mind when you go shopping. A 17-piece toy set may not hold the same appeal for a 2-year-old as it would an older kid. A simpler set made of durable materials, such as wood or plastic, would work better for toddlers. If you’re buying plastic sets, you’ll want to ensure that high-quality BPA-free materials have been used to make the products. Research has shown that exposure to BPA over long periods can cause medical issues (source). Being a children’s toy, it’s likely that some pieces will be hurled across the room or chewed on. Go for a product that’s built to last. It may cost more than other toys, but it will outlast them. Shopping is fun until you’re faced with a hundred different products and you’re no longer sure which one to buy. We’ve simplified the process, so let’s dive in. This is a priceless set for children who love copying what adults do around the table. 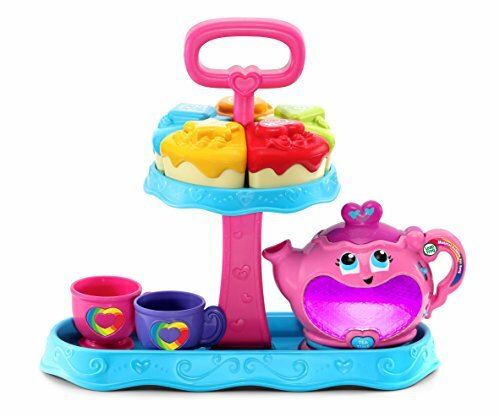 As your baby pours tea into a cup, the spout magically lights up and you’ll hear glugs and songs. The pot has several buttons you can press to listen to more sounds, songs, and phrases, like, “Can you please pass…?” It’s an excellent toy to teach your toddler table manners. This 10-piece set comes with an open-and-close teapot and sugar bowl, two cups, one spoon, and five yummy-looking treats. As your child becomes familiar with this toy, they can try arranging the treats on the puzzle-shaped tray. Do you love having tea with your kids but you’re not sure your cups will survive the experience? These mix and match colored tea sets are made from recycled plastic and contain no PVC, BPA or phthalates. They’re tested for the highest quality, and they’re safe to drink from. Cleaning them is pretty easy and you can even throw them (not literally) in the dishwasher. The 17-piece set comprises of a teapot and sugar bowl with lids, a creamer, cups, saucers, and spoons. 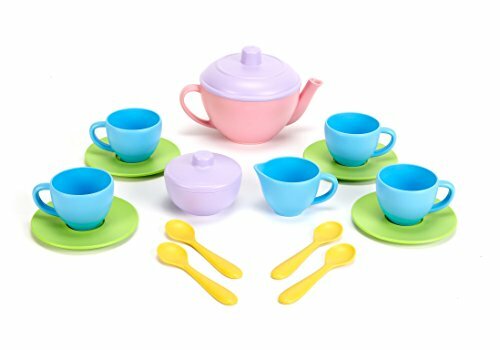 Made from food-safe plastic that’s free from PVC or BPA, this set is designed to create memorable tea parties. Alongside delicious treats, your child can serve iced teas, juices, water, and other cool drinks to their guests. The 15-piece set contains a teapot and sugar bowl with lids, creamer, cups, saucers, and spoons. It will definitely appeal to the young hostess (or host) and their party, and you’ll see them enjoy sipping and socializing. What’s a party without sound or music? This pretend set is an excellent choice whether your child is alone or in the company of family or friends. It features a magical teapot, teacups, slices of delicious looking cake, and a cake stand. The teapot will make glugging sounds whenever your child pours out tea. It also lights up whenever the pot appears empty. Plus they can press the heart-shaped button to listen to playful songs and engage in several activities. Children aged 1 to 4 years will be delighted by this set. This antique and dainty looking set will remind you of English high teas and propriety. 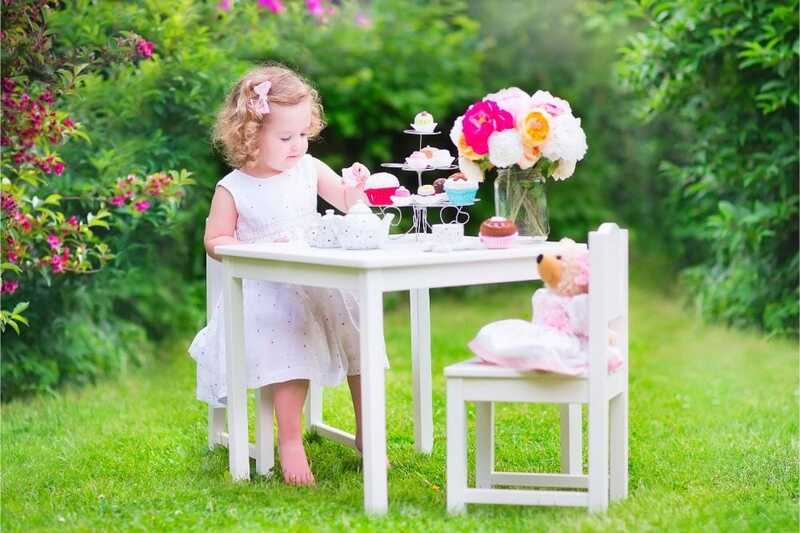 So how about getting your kids to dress up and conjure up an accent for an English tea party? 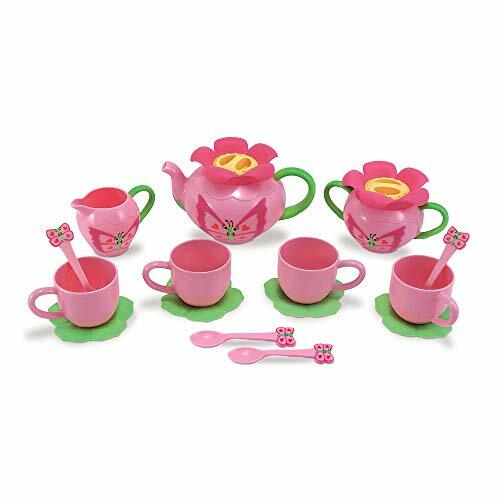 Ideal for children ages 8 and above, this 13-piece ceramic set is the picture of timeless elegance. It comprises of a classic teapot with a lid, teacups, saucers, sugar bowl with a lid, and creamer. 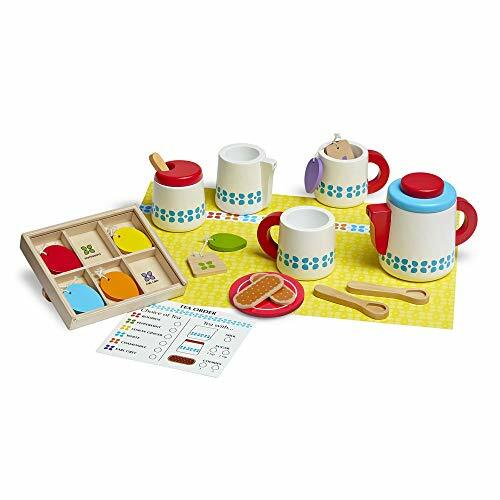 This brightly-colored set is made using BPA-free plastic and will go further than just pretend play. Your children will be able to pour actual liquids into the cups and drink from them. It’s a 15-piece set that includes a teapot and sugar cup with lids, creamer, teacups, stirring spoons, and saucers. They’re all sturdy, durable, and dishwasher safe. Let your child cross over from chilly winters and into dreamy summers with Olaf and his amazingly creative set. Whether you’ll use it for play or not, this set will look totally cool on your child’s bedroom shelf. 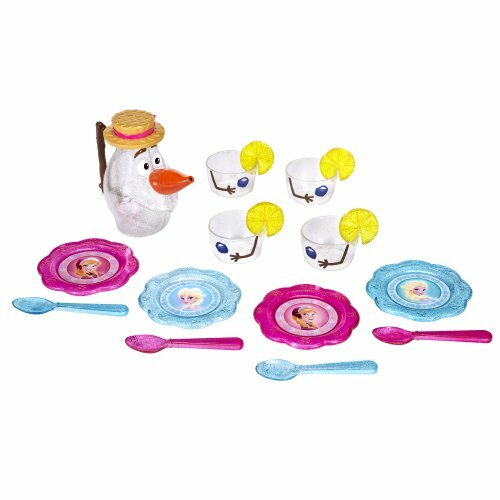 This 17-piece set uses Olaf’s body for the teapot and cups, complete with the carrot nose as a spout. You also get plates with pictures of Elsa and Anna, plus lemon slices and spoons. It’s great for Frozen fans aged 3 years and over. All the princesses are coming for tea, is your hostess ready? 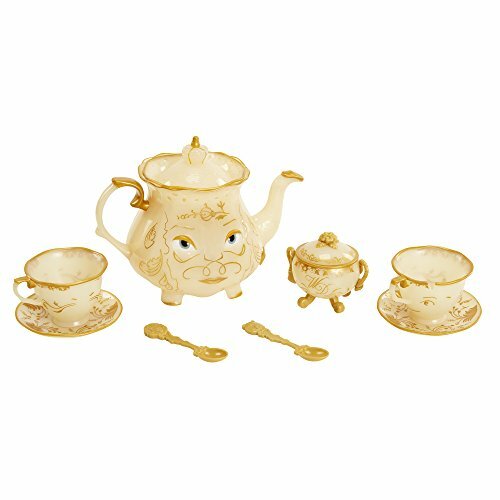 This elegant porcelain set works for children who are 8 and over. It’s adorned with cute butterflies and allows them to host a delightful party anywhere, anytime. The 23-piece set contains a teapot and sugar bowl with lids, creamer, teacups, saucers, spoons, and more. 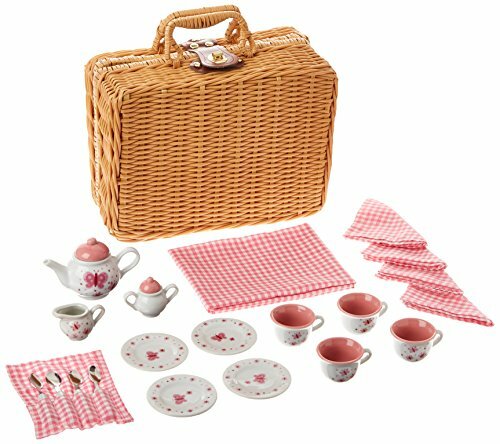 You also get a beautiful picnic basket with a latch and handle. 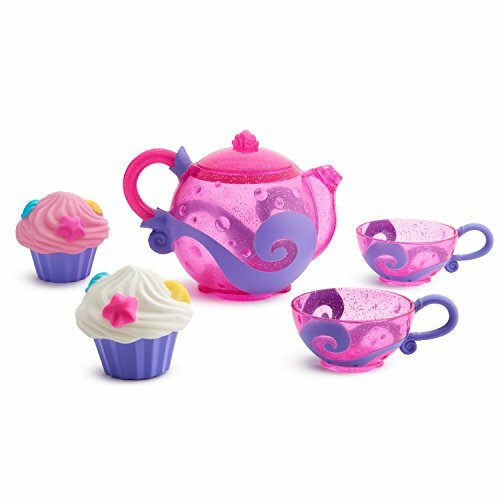 Not into princess style tea sets? 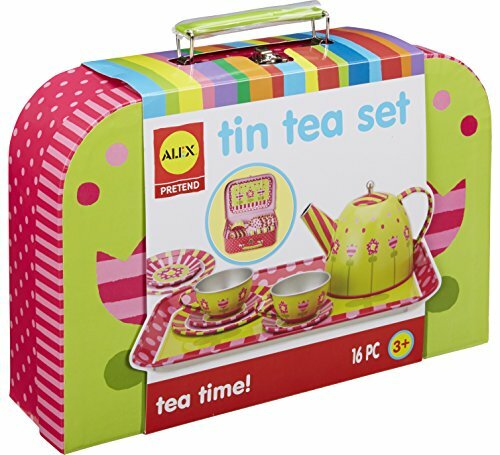 Schylling provides a wide range of toy tea sets to choose from. You can opt for Curious George or a ladybug theme, among others. 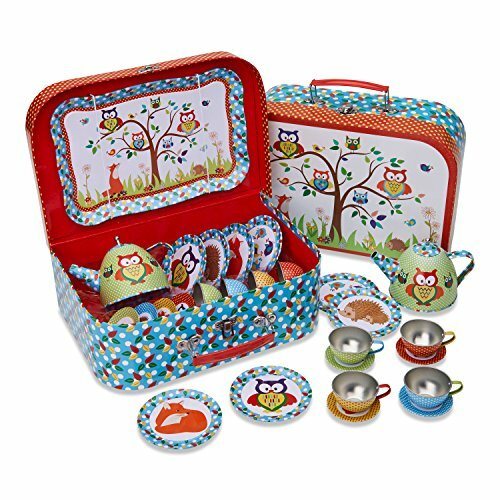 This lovely tea for two wooden set makes a great pretend-play toy. It contains a teapot and sugar bowl with lids, milk pitcher, cups, spoons, cookies, and assorted tea bags. It also comes with a dry-erase order card that your child can use to write down orders from their tea-loving friends. This set encourages imaginative thinking, and the tea bags, in particular, are great for color recognition. Once upon a time, an evil witch cast a spell and a doting housekeeper was turned into Mrs. Potts, the teapot. Her son, Chip, became a teacup. Inspired by the infamous Disney movie, it will warm your child’s heart as they play with it. Mrs. Potts eyes blink whenever tea is poured into a cup, while Chip wobbles, as usual, on his saucer. This cute set for two comprises of a teapot, cups, saucers, spoons, and a sugar bowl. It’s suitable for pretend play for ages 3 years and above. If you like combining fun with a little bit of learning, then this set is for you. You can reinforce your child’s knowledge of colors and animals with its vibrant colors and illustrated woodland critters. Besides, the critters make for good company and can be a part of the make-believe stories and play. It includes a teapot, cups, saucers, plates, serving tray, and a laminated cardboard case. If you love sipping on something sweet while soaking in the tub, so will your child. This cute little set comes with a teapot, teacups, and two cupcakes that look so good, you’ll almost want to eat them. It’s a great bath toy set for ages 2 and up. The teapot rattles when it’s empty. The teacups have strainers at the bottom for water to pour through, and they’re easy for your child to grasp. The cupcakes squirt water, for more bathtime fun. This award-winning, 16-piece set is simply adorable. Its vibrant colors are designed to catch the attention of your little ones and their friends. They’ll enjoy drinking invisible tea whether they’re outdoors or in the home. The tin set is durable and easy to wash. You’ll get a teapot, cups, saucers, plates, sugar bowl, and serving tray, all packed in a cute carrying case. 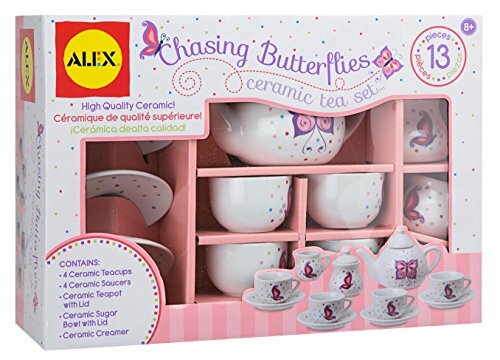 With so many adorable toy tea sets, it’s easy to want to buy them all. My all-time favorite is the Fisher-Price Laugh & Learn Manners. 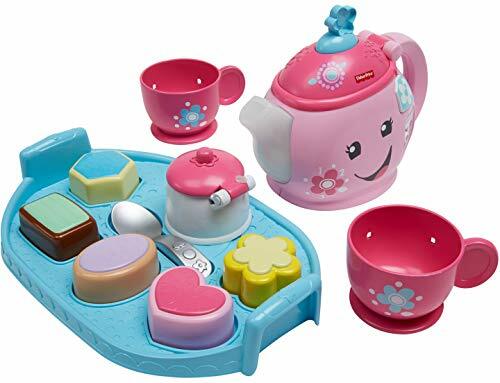 It’s just about the best toy tea set you can buy for your little ones. It uses cute sounds, music, and lighthearted instructions, to teach your child the manners needed in polite society. 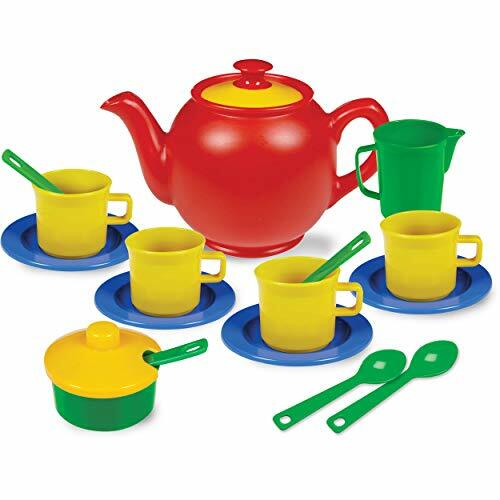 Toy tea sets are beneficial to your children. They help improve your child’s creativity, get their organizational skills in order, and develop their social skills, too. With this in mind, go for a set made from safe and durable materials, it will be worth it. What’s your favorite tea set? Let us know in the comments and remember to click the share button.